Facebook is rather one of the biggest social media platform ever. We make friends on Facebook and chat, share thoughts and memories through status, images and videos. Facebook is place where not only we make friends but many users play games, many developers, marketer, small business are dependant on Facebook. Just because Facebook is an easiest way to convey message to short period of time. Facebook users can easily reach millions of people through pages and groups. We have already shared our thoughts about how to increase page likes. But not only through Facebook pages or groups even we can reach as many people through profile. We can make friends and increase followers. Even people make Facebook female account to add friends frequently but all need a smart work. 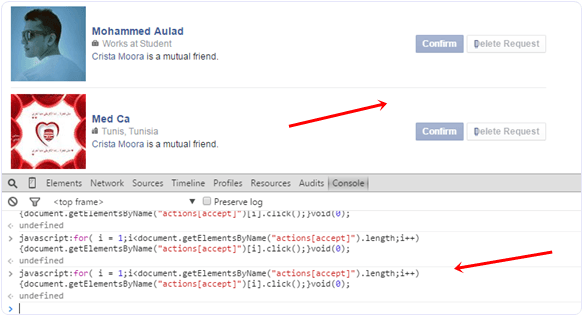 We already explained about how to add all friends to Facebook group on single Click. We know it helps a lot and save time. So today we are going to discuss about how to accept all friend requests on Facebook at once. Normally if our only motive is to increase friends on Facebook. Even we start getting more request as compare to normal user. So the problem we Facebook to accept them one by one which consume a lot of precious time. But don’t worry here is method to accept all friend requests on Facebook. If will help you accept them within few seconds. How To Accept All Friend Requests On Facebook. ? After opening above given link in browser. All Pending request will visible there. Now Click F12 to open console box or even you can open it by doing right through Inspect Element. Copy below given code and paste it in console box. It will look like as shown below. After pasting above given code. Press Enter and wait for sometime until all pending request will not get confirmed. Now Scroll down and make sure all request are accepted. In case their is a See more option then click on it. 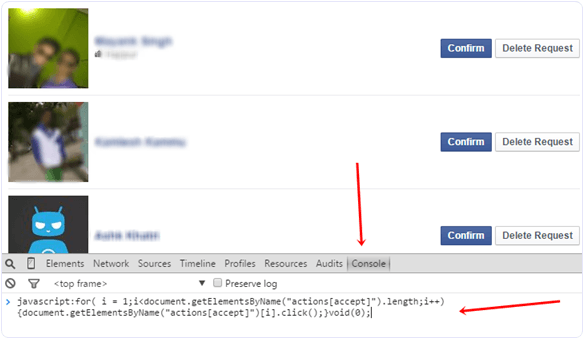 Again run the same script in console to accept request of pending request. Follow the same process until all the request will not get accepted. We hope you like this trick to accept all friend requests on Facebook at once. If you face any issue or want to suggest regarding this topic please leave your precious comments below.